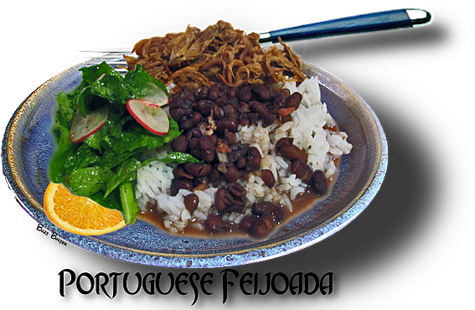 This dish which is originally Portuguese is now the National dish of Brazil, whose inhabitants are largely composed of Portuguese immigrants. A hearty dish that goes nicely with the breads of Portugal as well as Brazil. This is also a dish that envelops the flavors of fresh oranges. bacon and cook, stirring, until lightly browned, 4 to 6 minutes. 3. Bring to a boil, skim any froth that comes to the surface, cover and reduce the heat to a simmer. Cook, stirring occasionally,  until the beans are very tender, about 2 hours. Vinaigrette Sauce and Sauteed Collard Greens. 2. Add the rice and cook, stirring constantly, until slightly toasted and fragrant, 2 to 3 minutes. that the rice just simmers. Cook undisturbed until tender, about 20 minutes. 4. Remove from the heat and let stand covered without stirring for 10 minutes. 5. Fluff with a fork, discard the bay leaf, and serve. until light golden brown, about 2 minutes. and the beer is slightly reduced, about 15 to 20 minutes. 3. Remove from the heat and serve.